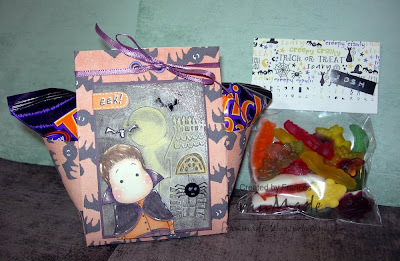 Just got these Halloween goody bags I made yesterday to show you. They are for my neice and nephew who live across the road (they get all my crafty outputs as the others are either too far away or too old !) They were soooo quick to make as the bags are just folded from 1 sheet of A4 and then decorated with some ATCs I already had. The tutorial is here on SCS. The DP is download from Pink Petticoat. Mine bulge out at the side as I used a sheet of printed A4 paper which is ever so slightly longer than the stated 8x11" piece (but I didn't want to cut it down to size, so just scored 2.5 from the longer sides and 4.5 from each of the shorter edges of the paper) actually liked it like this as it looks like a basket and I could fit more in. The little bag of gummy sweets are just some plastic card bags (I do have some proper cellophane bags from Lakelands but they are too big for this as I didn't want to give them too many sweets as I'm sure they'll get loads more tonight) which I've folded and stapled some dp across the top. Had to use my MS picket fence punch, you know what it's like with new toys! I just punched one end and folded paper back on itself. Probably should have inked it darker but it's only going to get chucked!. Simple but effective I think, then just added their names with my Dymo. Have a good day, and I'll see you tomorrow if not, come back next week when I'll try and sort out my blog candy and get back to some cards hopefully! CCT theme this week is 'cheers', so anything drinks related. Well, seeing as alcohol is never my drink of choice ( a) I've never acquired a taste for it and b) just a few sips would make me turn bright red and I mean red!, which is not a pretty sight . . . anyway, I digress, I opted for 'tea' and I so happened to receive my Simone stamp from Toodles & Binks the other day and what should she be holding . . yep, a mug of tea, perfect! Others: flowers, brads and teabag metal charm (off ebay) from my stash. Sentiment printed with my Dymo. Faux stitching around image doodled with black pen. Also, have just realised it's my Blogoversary today! "Happy Blogoversary to me, Happy Blogoversary to me, . . . . . . , Happy Blogoversary to me." Can't believe how quick the year has gone. I've also noticed I've passed the 50,000 hits, so thank you so much for all your visits and comments. This must mean one thing only . . candy time! So I'll put my thinking cap and will get back to you soon. Right, got the whole day to myself so will try and see if I can get a bit more creative as apart from my 2 DT pieces I've not made anything else this week. Think it must be the weather as I've seen a few other bloggers have mojo's going AWOL. I'm hoping some of the new christmas Magnolias that landed yesterday may jump start it (they are so cute and wow what fab, fast service from Sassy Crafts) and will have to see if postie has any more goodies for me today as my SN soft centres dispatched yesterday too. Have a good day everyone, wrap up warm and fingers crossed I'll have something to show you tomorrow. Tilda's been coloured with Promarkers then cut out and raised with silicone glue. The fab DP is from Pink Petticoat. I don't have any Halloween papers as I didn't really need any but they had these free when you bought the big dots download and at £1.99 I thought why not (there's quite a few designs in it, I love the little ghost one)! 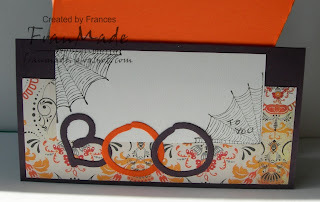 The tab is cut with my SU tab punch and Halloween cut with my SU word window punch. That's it really. Sorry for my lack of cards/visit this week but hope normal services will resume soon, please bear with me whilst my mojo is on vacation! 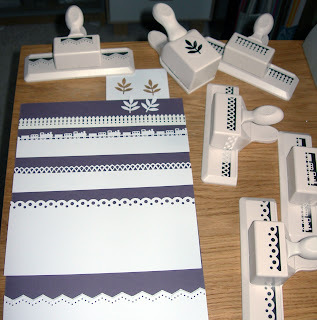 From the top:frond leaf punch, picket fence, train, arch lattice, scallop dots, embossed zigzag. Hope everyone's having a good week so far. Sorry I've not managed to post any new cards over the weekend or yesterday but my Mojo's on the wane and I think it may have something to do with me having to work a couple more evenings at our shop now and Mondays I spend with DH so it's all eating into my crafting time (but on the other hand is good news as it means business is doing o.k despite credit crunch and I'll get a bit more pay to feed this addiction of mine ;D). So anyway, I tried to follow the sketch over on Fri sketchers with an image I had sitting on my desk but it wasn't happening and I wasn't in the mood to 'phaff' and mull over it like I usually do so just did my own thing in the end and made this quick card. Looks a bit bare but I think I'm just used to looking at lots of layers and embellies. 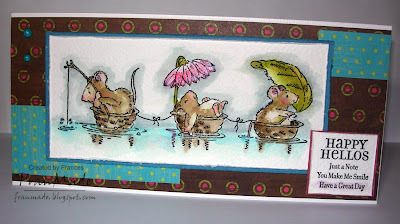 Not much too it really, the image is a PB stamp 'gone fishin' watercoloured with distress inks, papers are an old PM pad and the sentiment is from a SU set 'lots of thoughts'. 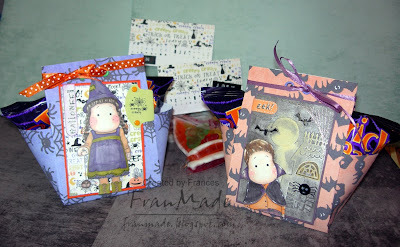 I'm hoping to get my mojo back Tues as I am free all day so will see if I can rustle up something better for my DT work (got that fab Toodles stamp I showed the other day). I shall leave you with a piccy of some of the angel charms I made the other day (inspired after seeing Marlene's cuties a while back) and which, hopefully, should be winging their way over to Carole's as we speak as I offered to sell her some after we got talking the other day. Edited: For those asking about what beads I used etc, I found them all through various ebay bead shops. You will need to get various bits and there is no set list. 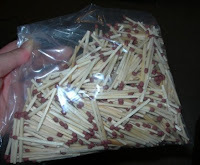 I just shopped around after seeing someone elses and adapted them to the beads I found, so these are unique to me IYKWIM. The main components are: glass tulip flower cups for the skirt of the angel, glass or metal angel wings, a round bead for the head and spacers or whatever else you think will work for a halo and bits inbetween. The size for the head will depend on the size of the skirt and wings and again is whatever you think looks right. For anyone who doesn't want to make them themselves and would just like a few, I can sell you some but it's my own personal stash and not a business so I don't have loads to sell. It's £1.50 for the large angel and 80p for the mini angels (at the front) plus whatever postage will be (Paypal only). Email me with your preference and I'll let you know if I can do it and the size of them etc. (top right of blog). Thank you for all your lovely comments. Don't know where this week has gone but seemed to have blinked and missed it. so, no card today but just had to show you ****** who is the next stamp in the Toodles & Bink range and should be available very soon. I just think she looks so sassy and trendy - great for more contemporary girly cards for your more sophisticated girlfriends or teenageers don't cha think?! Anyway, can't wait to get to play with her but if you fancy a chance of winning her then head on over here and you could if you can guess her name. Good luck! Think I've just made it for this week's Friday sketchers (It's all Carole's fault ;p, I've been 'chatting' to her on and off all day and got side tracked). Also, looks like Blogger's been updating their comments box so if you're having problems leaving comments, sorry! but it's not anything I've done. Hopefully it's just another blogger blip and it'll get sorted soon. 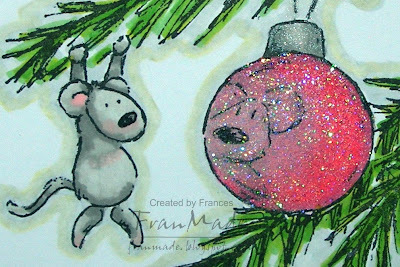 Back to the sketch, where I've made another christmas card (you'll be seeing lots of them from now on) but this time with my other new Toodles stamp. Meet Joel the Reindeer, don't you just love his big doe eyes?! 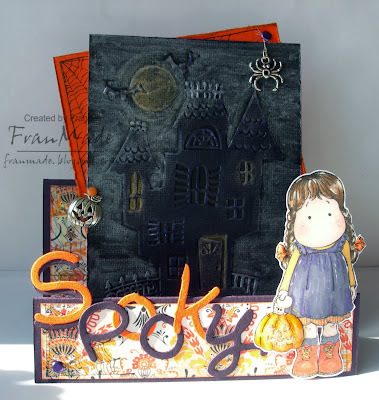 I've teamed him up with an old Penny black stamp for the background. Colouring: Promarkers on tilda and diamond glaze over the pumpkin. She has been curved and stuck on with silicone glue. Watercoloured around the embossed haunted house with silver shimmer paint to give it look of a shimmery foggy night, with a bit of gold around the moon and in some of the windows. Had fun with this. Hope you like it & thanks for stopping by. 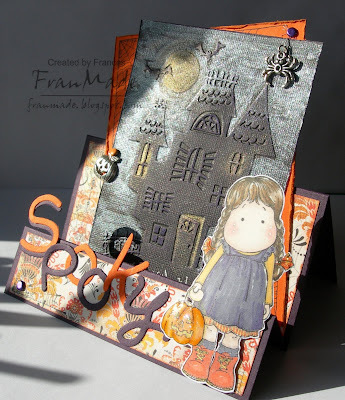 ATC theme this week is golden tones of Autumn, perfect for me as I love Autumn colour tones. 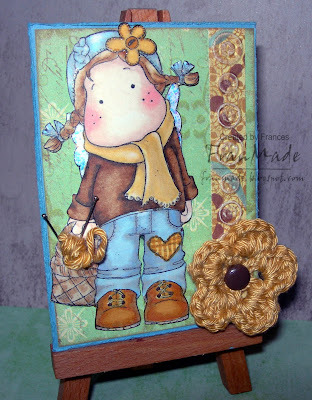 I've used scraps of dp from another autumn theme card I did last week, this super cute tilda from the Autumn range and one of my crochet flowers (thought it matched the one in her hat!). Tilda has been coloured with Promakers, bit of stickles and touch of Sakura stardust pen round her flower and hair bobbles. Seh's been curved before sticking down with silicone glue, so she's raised off the ATC (can never capture that well, my photo skills are pants). Edges of the paper have been inked and distressed and yellow strip embossed with my cuttlebug button strip folder then lightly sanded. Do you like tilda's knitting basket?! I had excess wool from the ends of my flower and was wrapping it up in my hand to throw away when I happened to look at the basket and thought it looked a bit bare so got 2 pins and stabbed it into the wool to look like knitting needles, then cut a slit in the basket and slipped the ends in - I think it works :), don't you?! Don't forget to hop on over here to see all the other fab DT creations, but more importantly, join in with us. 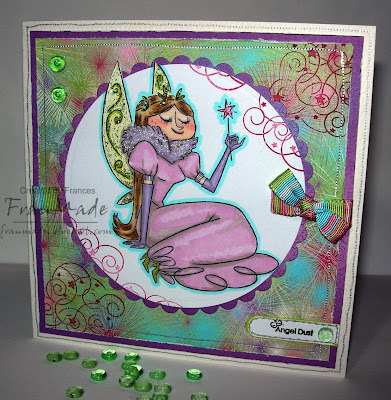 Received my first 2 Toodles & Binks stamps today from Stamp Galaxy, so had to have a play! They come unmounted in lovely red rubber so they stamp beautifully. This is Celeste, a fairy with attitude I think and has real presence, hence I kept the layout simple and let her do the talking! Have a lovely evening and I shall see you tomorrow with my ATC and possibly my other Toodles' stamp which I have coloured, just need to find some papers and layout for it. Thanks for stopping by. Spoonful of sugar: 生日快樂 . .
. . which is happy birthday in chinese. 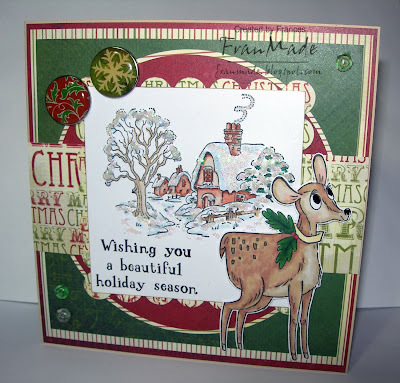 Which is the sentiment I have used for this card but brace yourself as I've made a NON cute card! 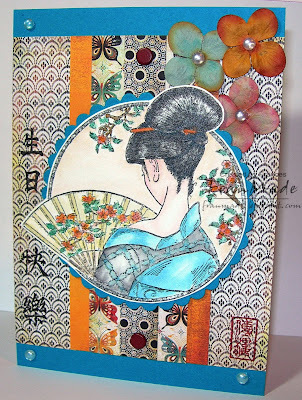 Images: 'oriental lady' creative expressions stamp, the chinese character sentiment I got years ago from Ally Pally show so don't know make as it's unmounted. the red seal stamp is set of 4 from Hero arts, again years old! The circular image has been raised on foam pads for added dimension and I've left the corner bits off from the sketch as it didn't fit/look right. It was going to be a square card but then I quite liked the burst of contrast colour the turquoise added so turned it into a rectangular card instead! Have a good evening and thanks for stopping by. now, now, I'm talking cards! This is for PTW challenge which is another fab sketch from Katharina this week (well, what's left of it! ), so thought I'd add to my christmas cards (not long to go now really!) and time for a more simple style, to suit the image. Images: Elzybells stamp part of the 'cold nose . 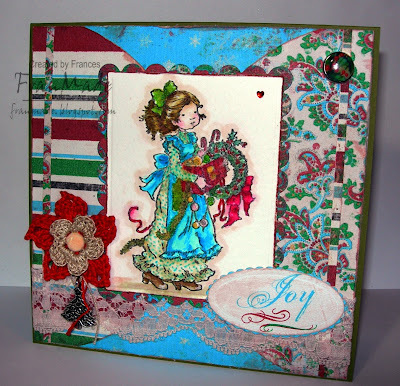 warm heart' dinky christmas set. 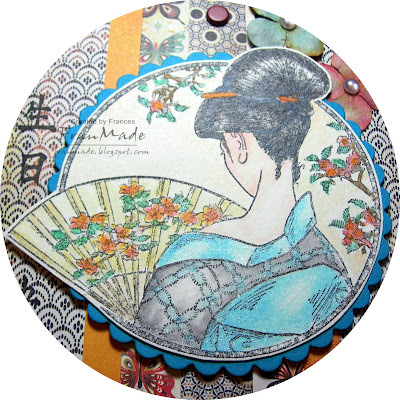 The circle sentiment is part inkadinkao set (the circle bit) and part studio g 99p set (the wordy bit) from last year. Hope you've all had a good weekend, I was naughty and added to my paper mountain by ordering the new Basic Grey 'Wassail' christmas papers. Have you seen them, they were just too gorgeous to resist! So I've got that plus some DT things to stalk the postie for this week :D.
Thought I'd use an Elisabeth bell stamp from Sugar Nellie, which I've had stamped out for months, but not got round to using even though I think they are gorgeous (have a few like that unfortunately)! 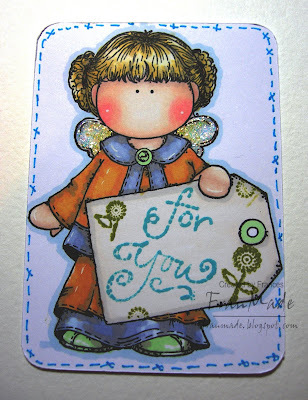 Images: 'Claudia the artist' (Sweet art ebony range of sugar nellie stamps from Funky Kits) the sentiments are from Hero arts sets (there is writing above the lace which you can't see in photo), the flourishes are an inkadinkado set. Others: lace threaded through with ribbon, more ribbon for the tag, pearl gems, butterfly charm, etc from stash. Have to say, I taken the photo at an angle and this has caused some of it to look like it's not straight, but it is - honest! Off to make lunch then I'm off to work for the evening. Have a lovely weekend and thanks for stopping by and leaving all your lovely comments. 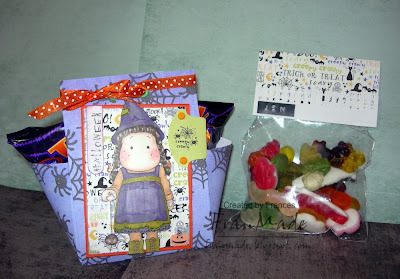 Talking of which it's my blogoversary end of the month so will have to think up some suitable candy to celebrate. Can't believe how quick this year has gone by! This week's CCT challenge is 'Autumn/fall'. I have gone for some earthy shades which seem quite autumnal to me and there's nothing like a hot cuppa curled up in your favourite chair on a chilly autumn day! 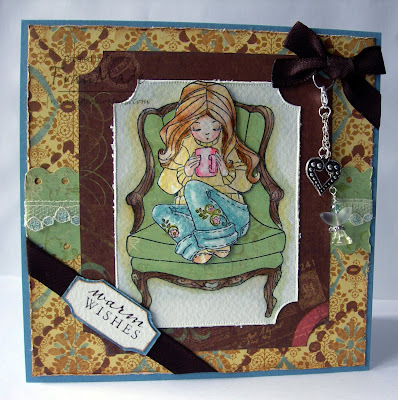 Images: 'Willow with hot chocolate' and 'Willow's armchair' - Whiff of Joy stamps. 'Warm wishes' sentiment from Hero Arts. I have cut Willow out and curved her before sticking her down with Silicone glue to give her some dimension, hard to tell in photo. Others: ribbon and lace from stash and I've made another one of my little keyring/mobile charms to hang off the bow that can be detached as a little gift. I was in a rush when I made this to get the photo done for CCT before I went to work last night (hence the colouring's a bit rough in places so don't scrutinize it o.k?!) but I have since added diamond glaze to her mug so it's nice and shiny now :) and I'm tempted to add some brown faux stitching around the edges of the yellow dp but may just leave it before I get carried away again. 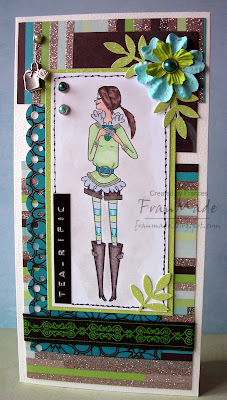 Tilda & Friends ATC: tag you're it! 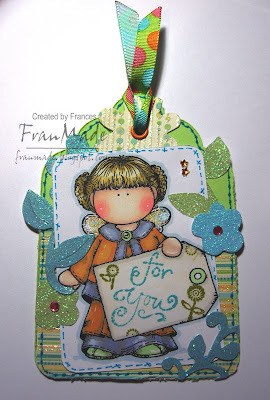 Theme this week over on Tilda & Friends is to turn your ATC into a tag. Have a good day. Just remembered I'm working tonight and haven't made my CCT card for tomorrow yet, oops! Best go get to it then. 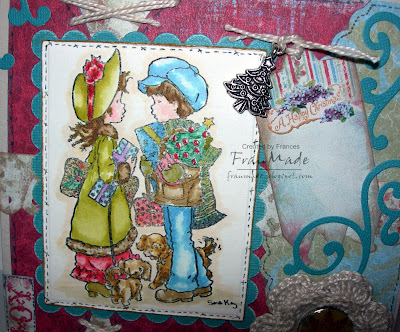 Went back to vintage/distress look for my Friday sketcher card as I've used another christmas Sarah Kay (boy was she hard to stamp out and colour, especially the box she's holding) and they just call out 'distress me' when I look at them. Others: rectangle scallop nesties to cut & mat image, fiskers circle cutter to cut the semi circles and heidi swapp distresser for all the edges. Crochet flower by me (need to get a deeper shade of red cotton - this one's a bit bright! ), brads, charms, gem and lace from stash. 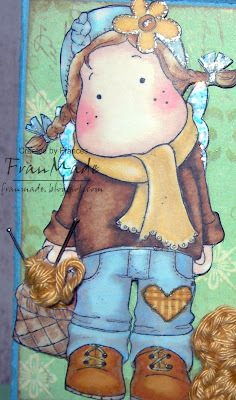 Have a good evening and I shall see you tomorrow for my 'tilda & friends' ATC. P.S I changed my blog background to a lighter one as the old one sometimes clashed with the cards, hope this is easier on the eye! I'll be back later with a card but in the meantime fancy some candy? Well then hop on over to Murielle's blog and you could win this little lot: You've got until Oct 17th, good luck! 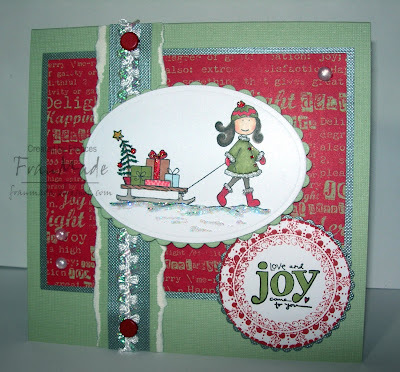 Quick & simple, bright card today after the last few vintagey, overloaded ones! 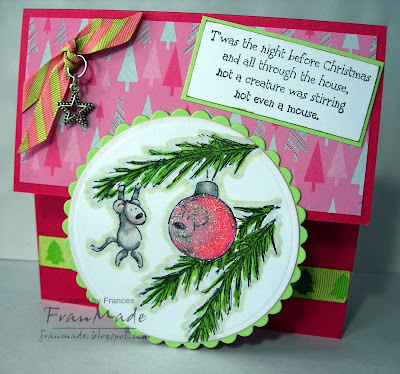 Spoonful of sugar this week is to use pink & green and my Elzybell mouse stamp was calling out to me and was perfect for this as the tree is green and I could colour the bauble pink! Colouring: what little there is has been done by Promarkers. Then added diamond glaze and glamour dust over the bauble for super sparkly bauble! Others: base kick stand card made from my stash of Papermill A4 cardstock (thank goodness for my scorpal, used to hate scoring my own cards but it's a doddle now). 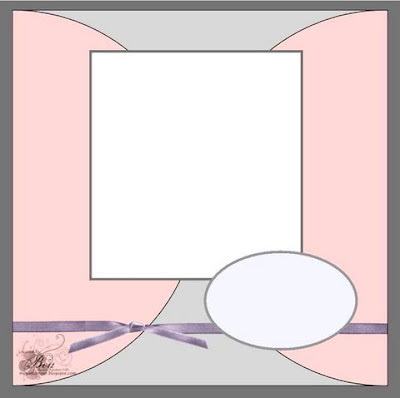 Circle Nesties used to cut image out, ribbons and star charm from stash. Have a good evening/day (depending where you are!). It's been a beautiful warm day here today after I had to have the heating on last week, really is global warming gone mad! O.K here's the card I promised earlier, only it took me so long phaffing with the layout that it's too late for the Ismaki challenge now, but all is not lost . . I've got some hand drawn/doodled faux stitching around all the edges so I can enter it for this week's Sarah Kay challenge, right?! Others: crochet flower made by me as none of my paper flowers matched! 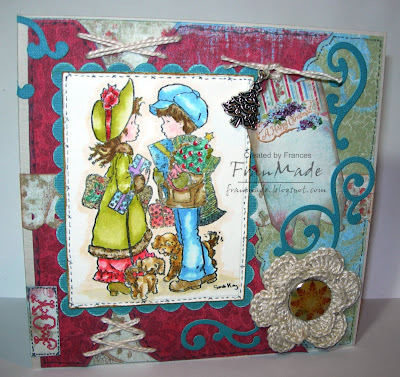 nesties used to cut out image and mat, edges distressed with Heidi swapp distresser and inkpads. Fiskars treading water border punch for the strip running behind the image. The semi circle bits cut by hand and hand sewn with crochet cotton. flourishes are a quickcutz die. Think that's everything! Oh, charm and brad from stash. Right, off to watch the recorded Strictly results show with hubby now (have to wait for him!). Wasn't the boy's group dance hilarious?! Have a feeling Heather isn't safe although I'd rather it be Jessie - don't tell me! no card yesterday, got sidetracked! Sorry, no card yesterday but I got sidetracked with a lovely email and then I had to go work in the evening. I am halfway through a card I just need to stop dithering with the layout, make up my mind and stick it all down, so should have it posted later tonight. I got sidetracked as I got a rather unexpected, but lovely, email Fri asking if I wanted to be on a DT for a brand new stamp range which I didn't even know about! So off I went to have a look at the stamps and the artist behind it (as I couldn't do it if I didn't actually like the stamps or see the potential in them, now could I?!) and I have to say, it looks promising so I accepted! It's for Toodles & Binks, what do you think? (check out Rose-a-petits-pois, the artist's blog too, I loved it). It feels different to any stamps I currently own or help promote which is nice as it means a more diverse mix of cards for me to make (but still in the cute spectrum ;) ) which should keep me on my toes and make it a bit more interesting for anyone looking. plus it was such a thrill to be asked, thanks Kay! All exciting stuff, as the range is all still a bit of the unknown but that's half the fun I suppose! I'll keep you posted. 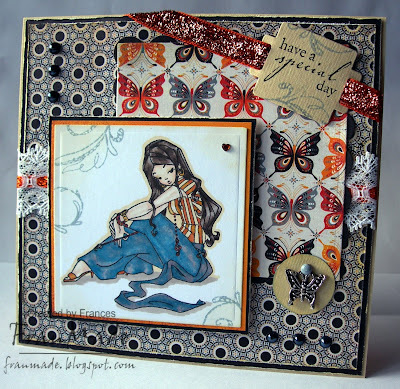 Tilda & Friends ATC: let's swap! And the winner . 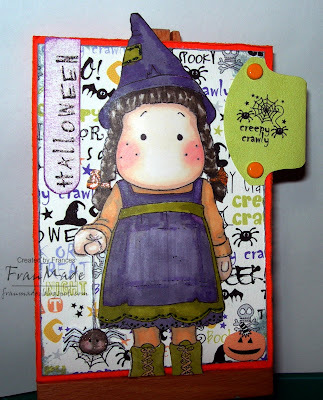 . .
TIlda & friends ATC: Eek!